Thanks to JB, The Four Seasons’ Music Is Celebrated! John Berlau of The Washington Times has a fantastic article about the music of The Four Seasons. According to Berlau, thanks to the hit musical JERSEY BOYS, the hitmaking foursome and their phenomenal music is now celebrated! In his piece, Berlau highlights the careers of the Beach Boys and the Four Seasons, noting that after four decades, the spotlight finally is shining on the contributions of The Four Seasons. Although the Seasons racked up many hits but always stood in the shadows of the Beach Boys and many other ’60s bands that were critics’ darlings. So what took the critics so long to come around? Part of the answer could be that the group wasn’t taken as seriously as the Beach Boys because it was primarily a singles band, continuing to concentrate on releases of 45s just as they were falling out of favor with the rise of “Sgt. Pepper”-era concept albums and FM radio’s album-oriented rock format. A more likely explanation is that the media just wasn’t as interested in the group because it did not make headlines as part of the ’60s drug culture, as did the Beach Boys’ Mr. Wilson and many other artists. Although, as the play shows, many of the band members were far from saints â€” committing petty thefts in their youth and entangling themselves with the mob â€” they largely “kept their problems to themselves,” Allmusic.com notes. As the “Jersey Boys” narrator explains, the Four Seasons’ fans were not the countercultural youth interested in “levitating the Pentagon,” but the blue collar and middle-class young people who were pumping gas, driving trucks and “shipping out” for Vietnam. Thanks to this hit musical, these fans finally have a voice, and the music world is better for it. Keep in mind that the Beatles broke up in 1970, and never reunited. The Beach Boys also had personnel changes, earliest and most notable with Bruce Johnston, around the same time as Nick Massi was replaced by Joe Long. Most bands have many personnel changes over the years and it doesn’t seem to matter to fans that much. Fleetwood Mac is another good example. 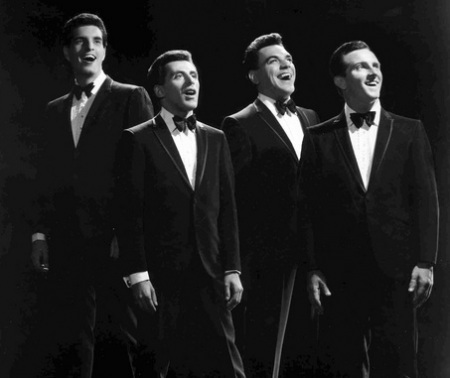 I think there was so much focus on Frankie Valli (deserved) that we, as fans didn’t know much about the other members? A lot can be said about the PR team for the Four Seasons, too. But as the article stated, the lack of a CONCEPT album hurt them the most. I am happy they are getting the attention now. I’m with Kariann. So happy that they are getting the attention now, and that a new generation is introduced to their music through Jersey Boys. An important component of the 4 Seasons live shows has left us…Joey Cass (Cassiere) passed away on Sept 25th. Joey was their road drummer from 66 through 70 who also participated on the GILG recordings. Many of us remember Joe’s solos on songs like “Caravan”, adding a great jazz beat to all their live performances. Joe Long: Our drummer Joey Cass has studied with some of the finest drummers of all time like Buddy Rich…Gene Krupa. Joe Long: What could he possibly learn frome Raquel Welch? Frankie: A lot more than he could from Gene Krupa! I guess he recently worked with Joe Long and Tommy DeVito with some new acts. Yeah, everyone forgets, or never even knew, the great Joey Cass. Joey was a great teacher too. We both learned to play from the same man: Joey’s Uncle Pat Scucchi. Pat was a very talented drummer/teacher who taught countless North Jersey drummers, many of them for free as a drum corps. volunteer. So many drummers owe their careers to Joey Cass and Pat Scucchi. This goes out to the comment made by Dynazor. You can also add my son who also took lessons from Joey and myself. Dynazor, what’s your real name? I played Hammond B3 with “Mario and the Flips” and The Funatics”, two show bands out of North Jersey in the early and mid 60′s. Joe Verdarosa was the drummer with Mario and he and his buddy Eddie Capone knew Joey Cass, took lessons from him and hung out at his music store. Joe V. was a fine drummer and Eddie went on to be a comedian in south Florida. They took me to Joey’s music store one Christmas Eve. Joey was serving Scotch and Cookies. A woman came in to pick up a set of drums for her son and Joey dissapeared with her in the back room for quite a while. I was in Dental school at the time. Joe V. Told Cass he should let me fix his teeth. Joey said, “Yeah, I’ll give him a shot!” What a character! I played Hammond B3 with Mario & the Flips, and the Funatics, two N.J. Show bans in the 60′s. Joe Verdarosa played drums with Mario. He and his pal Eddie Capone took lessons from Joey Cass & hung out at his music store. They took me there one Christmas Eve and Joey was serving Scotch and cookies. A lady came in to pick up a drum kit for her son and Joey disappeared with her in the back room for quite a while. I was in dental school at the time, and Joe V told Cass that he should come to the clinic and let me fix his teeth. Joey looked at me and said “yeah, I might give him a shot!” What a character. Also heard story about him falling off back of stage at “dark” beginning of Seasons show. I think he had some vision issues. Anyway, I’ll never forget meeting Joey Cass and being greatly impressed by his playing with the Seasons and his session work. He was unforgettable! I took lessons from Joey Cass in 1968 at Music Time in East Rutherford on Park Avenue. He later opened his own music store in Hasbrouck Heights. He was a great drummer and drum teacher, although a little intimidating for an 11 year old kid. Great memories of a fine musician.